I never got a November newsletter out. I’d been feeling increasingly tired, even exhausted, and I dragged myself to the doctor (Dr. Curtis Black at Philomath Family Medicine: he’s good), and got referred to Dr. Mark Reploeg at the Sleep Medicine unit of the Corvallis Clinic (he’s good, too), and … sleep apnea. Well, that would explain it! So I’m being treated and my energy is gradually returning to normal. I blog about this experience here. 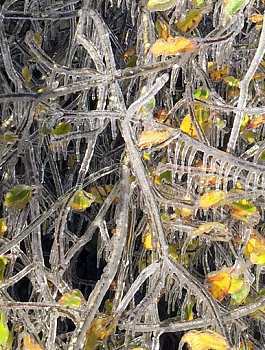 The dry fall ended and we got some rain, and then we got an ice storm, with temperatures hovering right around freezing and ice accumulating thickly on the trees, some of which hadn’t lost their leaves yet. Our power was out for over three days. During the first evening, I stood on the front porch with a cup of coffee in my hands and listened to the sound of branches trees falling nearby. Crack! Thud! Repeat! It made me glad I live near a forest and not in one. 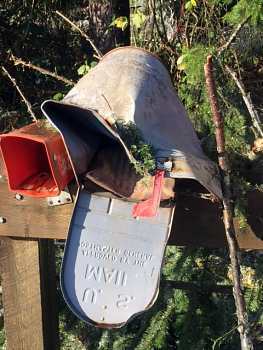 In the morning we found our mailbox smashed by a fallen limb, and the power wires down between our house and barn. The chickens are all fine, with no damage to any of our rather flimsy chicken houses. The electrician fixed the downed wire with no problem, we got a new mailbox, and all is well. Which is better than I can say for the neighboring forests. Plenty of limbs and big trees fell, including ready-to-harvest Douglas Firs. And a lot of medium-sized conifers lost their tops: the top ten or 20 feet of the trees bowed under the accumulated ice and then broke off. I’ve never seen anything like it. Our Honda generator started on the first pull. This always amazes me! It had been sitting unused for a year, and we didn’t prep it for storage, we just closed the fuel valve while it was running, and let it run until the carburetor was empty and it stopped. Several of the UPS systems we use for our computers (and even our TV) had disappointing battery performance, and I’m in the process of replacing some batteries. I recommend APC Smart-UPS systems because they’re more generator-friendly than most, and are available with big batteries. I never buy them new anymore, since the units seem to last forever if you replace the batteries when they die. You can get used ones with dead batteries cheap on Craigslist, then replace the batteries, or you can buy refurbished units with new batteries over the Internet. We ran low on seasoned firewood. Sigh. As some of you know, I got interested in hypnosis after using self-hypnosis to eliminate my insomnia. My dad also taught me a couple of simple self-hypnotic self-help techniques when I was a child, especially to get through dental visits (dentistry used to be a lot less pleasant than it is now). So I took a full training course in hypnotherapy (and then two more), and opened a part-time practice in Corvallis: Robert Plamondon Hypnosis. Which has been a pretty cool experience. But my newest site is for alternative/unlicensed practitioners in Oregon who want to do things legally and ethically, and also not run afoul of the sometimes-bizarre obstacles that the State of Oregon puts in our path. The State of Oregon has chosen not to license a wide range of alternative and not-so-alternative practices (because it’s Oregon, that’s why). So there are broad exemptions, but also some rules, and the rules are more or less hidden, leaving people open to some nasty surprises. I had to do an amazing amount of digging to unearth even the basics. This surprised me, because the other branches of the state government are super helpful and do all kinds of outreach. Anyway, the new site is unlicensed-practitioner.com, and it sets forth the basics as I currently understand them, aimed mostly at the hypnotherapist/counselor/life-coach/NLP practitioner end of things, which is the part I have some kind of grasp on. Egg production falls dramatically when daytime highs fall below freezing. Chickens are much more cold-tolerant if they are dry and out of the wind. They’ll get frostbitten combs and other problems not much below freezing in damp houses, but I’m told they hold up pretty well until about -20 F if they’re dry. Chickens that roost in evergreens over the winter will have a wonderful time but won’t lay any eggs. Egg production will fall after an interruption in water that lasts a day or longer, so keep it flowing! Other shocks (running out of feed, horrible weather) will also cause slumps in egg production. Egg production will likely start climbing around New Year’s Day. Christmas is coming! And the baby chick catalogs always arrive right on the heels of the holiday season, getting everyone fired up about the coming poultry year, so now is a great time to give books to everyone you know who likes chickens (or gardening: Gardening Without Work is a fun book). All of these are fine books (I publish books I believe in). If you’re like most readers of this newsletter, you’ll enjoy starting with Fresh-Air Poultry Houses and Success With Baby Chicks. These cover the basics of healthy, odor-free, high-quality chicken housing and zero-mortality chick brooding, respectively, and get rave reviews from readers. I started Norton Creek Press in 2003 to bring the “lost secrets of the poultry masters” into print — techniques from the Golden Age of poultrykeeping, which ran from roughly 1900 to 1950. I’ve been adding an eclectic mix of non-poultry books as well. These include everything from my science fiction novel, One Survivor, to the true story of a Victorian lady’s trip up the Nile in the 1870s, A Thousand Miles up the Nile. See my complete list of titles at the bottom of this newsletter. Later in the winter, though, people start brooding their early chicks, so the stakes get higher. If you want to have pullets laying well by the start of a traditional Farmer’s Market season (Memorial Day), you need chicks in January. If you hatch your own eggs, that means hatching eggs in December. Slow season? Wait, wasn’t winter supposed to be the slow season? Not to mention that the hatchery catalogs will start arriving right after Christmas, with special low prices on early chicks. By January, you’ll be on fire to start the new season! Do final winterizing before things get really nasty. Stake down portable houses. Ensure plenty of liquid water for your chickens in cold weather. Warm water is better than cold if you can manage it easily. Give your chickens as much feed as they want. Winter is no time to save money on feed. Keeping warm requires lots of calories. If you have a breeding flock, figure out your matings now.